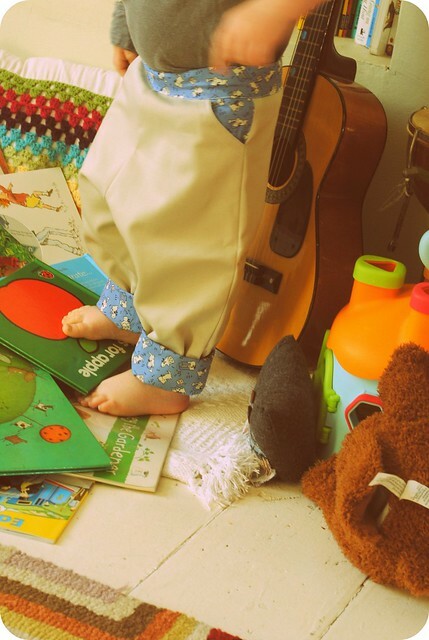 Milo is pretty short of trousers at the moment, due to potty training, the lack of a big ol' nappy means he's a lot slimmer than he used to be, plus we do a few more daily trouser changes now, add in there a bit of a growth spurt and it became apparent it was time for some sewing! I've been using the basic 'trace round a pair of trousers' technique for pajamas for a while. This works out great for simple trousers and also great for easy up and down (brilliant for potty training), but ideally wanted to make something with a bit more detail. I saw this tutorial on pinterest a while ago and have been eager to give it a go ever since. As the pattern itself is for a 3 year old, I copied down the basic idea and drew out my own pattern pieces. It all worked out OK, but I definitely made a few foolish mistakes. The legs are too tapered, when in fact they should probably have been straight, plus a little too long (not a big problem when they are intended to be turned up anyway). But they do the job and Milo seems to like them, plus as with most of my sewing adventures I learnt a lot and next time they will be better. 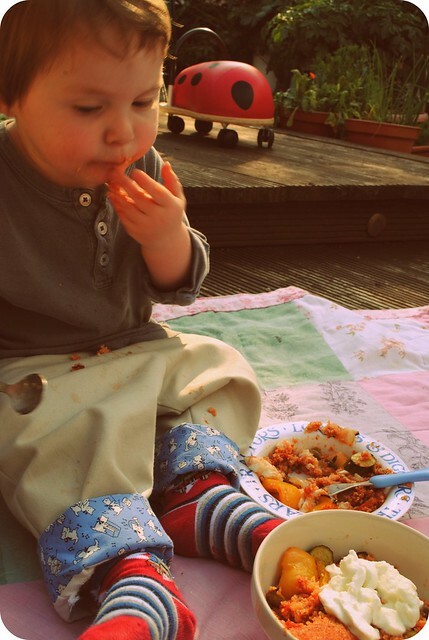 It is super tricky to get a 2 year to model nicely for you in said trousers, hence the rather blurry pictures and I didn't get any of the trousers sans baby prior to the below episode of supper on trouser activity! So apologies for the lack of pictorial evidence. fabric :: a mixture of charity shop finds and scraps I had stashed away.